Mind you this came from the person who follows recipes verbatim. So here I was trying to make this new dish with the minimal direction and plenty of skepticism about the lack of garlic and any type of quintessential Persian spices. So I scratched my head a little, thought it over, then walked into the kitchen and began an afternoon of cooking marathon. I say cooking marathon because I made two different dishes that day. And the irony is that by the time I was done with this dish I was sooooo hungry that I ate and completely forgot to take a nice picture of the finished product! So the picture above is from the leftovers! Add turmeric and give it a stir allowing for the spice to release its flavor. While my mom said no turmeric, I decided that this is one of the most important steps in building your base for each khoresht. Turmeric adds a good flavor to the meat and broth. Add the meat and let it brown in order to seal in the flavor. Add 3 cups of water, cover and cook for 45 minutes. In the mean time wash and dry the parsley and mint. Give it all a rough chop. Finally, add the herbs. Give it all a stir and let cook for 1 hour on medium heat. The result was very good. It was definitely worth a try! There is this nice blend of mint, parsley, and a hint of the delicate taste of the plums in every bite. Depending on how sour your plums are this dish can come out a bit sour. Mine was not sour, the balance of flavors was just perfect. There is always the option of adding some sugar if it is too tangy. I love, love, love your website!! I also love khoresht gojeh sabz. Just a thought, but have you tried sauteing the mint and parsley in a bit of oil before adding them to the beef mixture? It makes it ultra delicious!! Thanks so much for stopping by and commenting. You know what? My mom did tell me to sauté the mint and parsley and I completely forgot about it. But I can just imagine how much better it would taste. Thanks so much for this recipe. My husband found it after a branch broke from our old Santa Rosa plum tree, and I suddenly had 3 big bags full of plums, most of them unripe. It’s a perfect base for improvisation – I add garlic, a bit of cinnamon. The first time I made it with beef, and it was delicious. Sour, but we like that. Right now chicken and chick peas are stewing in the crockpot, awaiting the plums and herbs, then guests. You used whole plums, but I worry that a guest will break a tooth on a pit, so I will halve and pit mine. I am glad you enjoyed the recipe. Lucky you for having a plum tree. The additions sound delicious. Where do you get the gojeh?? Never heard of this khoresh, I must try it as there is plenty of godjeh sabz at the market. You are amazing. 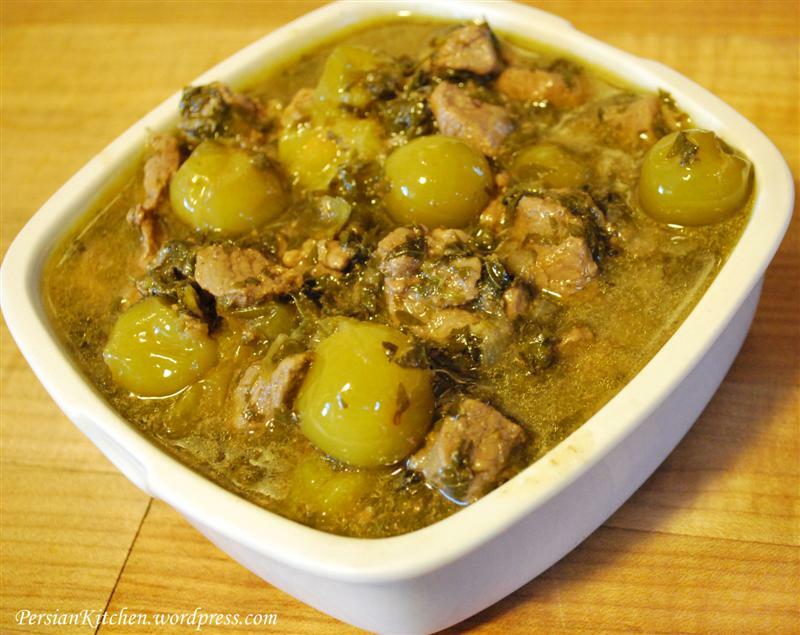 I made this recipe this weekend for some of Iranian friends they love it and me too this is the first time for me to try and eat Khoresht Gojeh Sabz….I love it. Thank you so much for sharing your experience with us in this amazing blog.